Hello and thank you for being readily available for an interview. Who am I takling to? Your latest release was about one year ago, your last full-length album already two years - are you currently working on something new? No, at the moment were not working on anything. 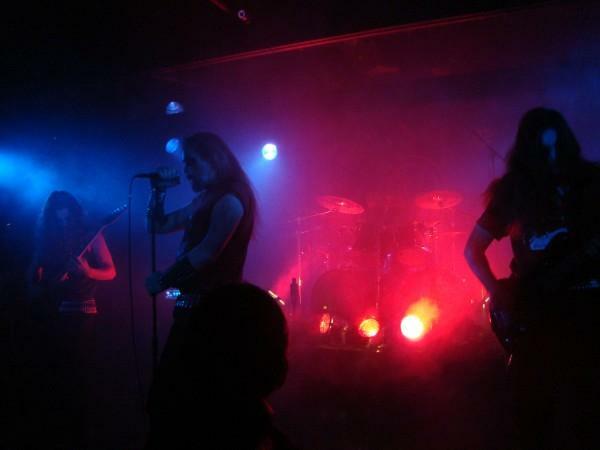 On 'Haatstorm', although the release offers around one hour of black metal, only three tracks were previously unreleased. One may think of 'Haatstorm' as constitution of what Zwartplaag is all about. Is that correct? What advancements have you been going through since your first demo, back in 2005? "Haatstorm" is indeed the embodiment of Zwartplaag, it is everything the band is about. Since the first demo the band has grown musically, mentally and even in members (since the first 2 demo's were just me on guitar and vocals with a drumcomputer). The guitar riffs became beter structured as did the drums. There were a couple of years between the second and the third demo and in this period there were a lot of line-up changes. A rehearsal tape was made during this period, but this tape was lost before it ever was released. The third demo is completely different than the first 2, the music by then had gotten so much beter. After the third demo we finally found another drummer made of flesh and blood and a bass player, so we were able to work with a complete line-up again. After "Haatstorm" the tracks evolved further in songwriting. The promotional material (pictures, etc.) of Zwartplaag outlines a rather traditional understanding of the black metal movement. How do you see this movement nowadays, and what position do you take therein? Zwartplaag always has taken a rather traditional side in the promotional materials. This has been done delibarately bacause we feel this fits best with our Music. I personally always favoured the traditional side of black metal promotion. I don't know how this all is nowadays, I'm not really that interested in it. 'Haatstorm', within numerous reviews, has been compared to many artists, including Summoning, God Dethroned, Satanic Warmaster, Satyricon and many more. Which artists, in your opinion, would you find yourself preferably compared to? People are always going to compare bands with other bands. Zwartplaag was indeed inspired by Summoning (intro's), Satanic warmaster (especially on the split with Faagrim) and even some early Satyricon. The biggest influence for the music of Zwartplaag were Seigneur Voland and Kristallnacht. The lyrics on the other hand never involved any politics and were traditional anti-christian and hateful towards mankind. Malicious gossip has it that the musical contribution to what is generally considered as being in constant evolvement concerning black metal doesn't match that well with your raw 90's musical style. Do you agree? Well I personally feel the band evolved on the split with Faagrim and I think this is natural. Musical growth is something probably every band experiences. This does not have to mean that a bands entire sound has to change every release. The first 2 demo's for instance sound completely different than the "Haatstorm" album. There are no publicly available lyrics of your music. What are you dealing with in your lyrics? Do you generally consider lyrics to be an important aspect within the genre and for yourself? We deliberatly choose not to print the lyrics for no particular reason. The lyrics are anti-christian and hateful towards mankind and inspire individual thought. Lyrics at least for a big part define the message of a band, so this is of course important. On the other hand I don't care enough about it to read every lyric of every song of every release I buy. On the very lowest level, music is, at least, entertainment. What is Zwartplaag expressing beyond this point - to yourself as artists, and to your audience? What you see is what you get. Hateful bm in Music and this was expressed on stage and in promo pictures. Zwartplaag never made its music for the sole purpose of entertainment. As I recall a lot of people hated the first 2 demo's because they were very raw, we never cared (of course it's always nice to read a positive review or to receive a compliment on our music). Zwartplaag always made its music as an expression. This is occasional. The titles are chosen because they best fit the release. Some times I feel like writing lyrics in Dutch and some times I prefer to do it in English. Some things are beter expressed in Dutch or English. Thank you very much for your time. The last word is now yours. Thank you for the interview and your interest in Zwartplaag.